Powers/Abilities: Nenaunir has a number of mystical abilities, only a few of which have been observed. He could teleport himself across great distances. 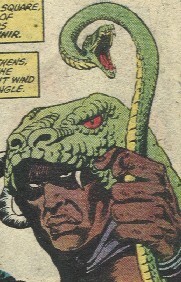 He could summon the Snake God, Damballah. Even Thoth-Amon was subservient to him while in Zembabwei. In addition, Nenaunir had great physical strength, although not superhuman. 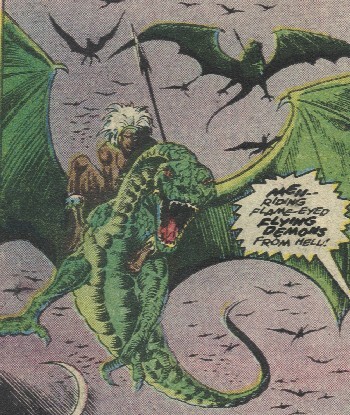 (King Conan#3 (fb)) - In the distant past of the relatively young Hyborian era nation of Zembabwei (in the region that would become known as Africa thousands of years later), a pair of twins tamed the flying reptiles known as Wyverns. These twins became ruler of that nation, and it was decreed that Zembabwei must ever be ruled by pairs of twins. When one of the pair would die, the other would slay himself, or else be slain, and then the priests of Zembabwei would choose new twin boys as their successors. This form of government went well, until the reign shared by Nenaunir and MBega, @ 10000 BC. Nenaunir eventually fell in with an ancient cult dating back to Acheron --@ 15000BC, who worshipped a serpent god known as Damballah. This demon god promised greatness to Nenaunir if he and his followers would worship him. 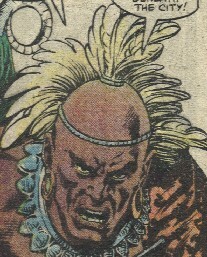 Nenaunir's conversion tore the people of Zembabwei into factions. Rather than see the kingdom rent asunder and drowned in blood, MBega surrendered his sceptre to his brother. Even this did not satisfy him, and Nenaunir set out to slay all who would not bow to Damballah. Realizing his mistake too late, MBega ked a revolt, but by then his followers lacked the power to oppose him. 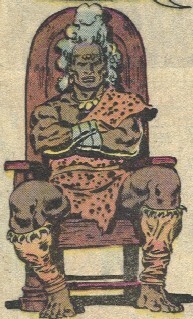 MBega was captured and imprisoned, though Nenaunir dared not slay him at the risk of causing a massive uprising. Nonetheless, Nenaunir kept MBega in chains, occasionally parading him bound before the people of Zembabwei, and flogging him at the show of any defiance. 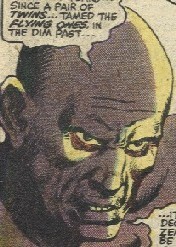 Under the study of Damballah, Nenaunir learned many of the black arts of sorcery. (King Conan#1 (fb) - BTS) - Nenaunir was contacted by Thoth-Amon, a powerful Stygian sorcerer, who proposed an alliance between they and two other sorcerers, Louhi of the White Hand and Pra-Eun of the Scarlet Circle, in order to topple some of the threats to their existence, and to oppose the kingdoms of the West. One of these perceived threats was the barbarian, Conan, now King of Aquilonia. (King Conan#1) - Nenaunir traveled to Louhi's Citadel of Pohiola, in Hyperborea, where she and her Witch-Men had brought Conan and his son, the young Conn. Nenaunir, like the other sorcerers, questioned Thoth-Amon's claims of Conan's threat to them. Louhi put Conan to a test, which he soon turned against them, slaying both Louhi and Pra-Eun. Nenaunir hurled an oaken chair at Conan, but then teleported away--as did Thoth-Amon--when it became clear that the tide was turning against them. (King Conan#3 (fb) - BTS) - Thoth-Amon, after being forced to again flee from Conan in Stygia, traveled to Zembabwei, planning to join forces with Nenaunir. (King Conan#3) - Nenaunir sent his Wyverns to capture Conan and Conn, which they successfully did. However, before Thoth-Amon could slay the two, Nenaunir denounced Thoth-Amon, pronouncing him to be only his agent, and announced that the Conan and his scion would be slain as a sacrifice to Damballah on the Night of the Red Moon, twelve days hence. This, of course, gave Conan time to make some plans to oppose him, and he made an alliance with the imprisoned MBega, and had him freed when one of his own Aquilonian soldiers managed to sneak into the dungeons of Zembabwei. 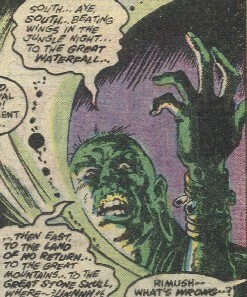 When the Night of the Red Moon came, Conan and Conn--who had been unable to escape themselves due to enchantments on their prison cell--were placed into a shallow pit, into which Nenaunir summoned the mighty Damballah. Even Conan's might could not long stand against the Serpent God, and after a mighty struggle, he began to black out under the strength of its mighty coils. Conn, however, had stayed back at his father's command, and he seized on opportunity when it presented itself. Conn grabbed his father's dagger and rushed at Nenaunir, correctly figuring that it was his magics that allowed Damballah to remain in the Earthly plane. Thoth-Amon saw what the boy was doing, but hesitated, torn between jealousy and prudence, and that was long enough. Conn plunged the dagger into Nenaunir's chest, killing him instantly, and Damballah faded back to his realm. Thoth-Amon escaped again, atop the back of one of the Wyverns. Meanwhile, MBega's followers--backed by Conan's soldiers, who had rushed the city when its gate had been opened from within--overthrew the partisans of Nenaunir. Comments: Created by L. Sprague de Camp and Lin Carter, adapted by Roy Thomas and John Buscema. There is some question on the identity of the god Damballah who is worshipped by Nenaunir. Thoth-Amon and several others seem to think it was just another name for Set, although Nenaunir strongly protested every time they named him as such. It doesn't seem too likely to be the African/Voodoo Serpent God, primarily due to the age (12000 years ago), and its evil nature. My guess is that it is most likely the Damballah that is the spawn of Set, first seen in Dr. Strange II#48, and confirmed in the Silver Surfer III Annual#2/7. Still, it remains uncertain, whether it is one of these beings, or a different being altogether. Nenaunir, an African Storm God, worshipped by the Masai of Kenya, not seen in the Marvel Universe, unless it's another alias/aspect of Shango. The twin brother of Nenaunir, he ruled by his side until his brother's involvement with Damballah brought about the approach of a bloody civil war. In an effort to prevent this, MBega stepped down and acknowledged sovereignty to Nenaunir, but ended up imprisoned and awaiting death. However, he was freed by an alliance with Conan, with which he overthrew his brother--who was slain in the process--and became sole king of Zembabwei. After this, MBega and his men taught Conan, Conn, and many Aquilonian soldiers to ride them, and they used them to follow Thoth-Amon. Mighty winged lizards, presumably descended from some sort of pre-historic pteradon, these were tamed by a pair of twins in the past of Zembabwei, and served as transportation and a potent form of attack since that time. One each abducted Conan and Conn, and brought them to Zembabwei, while another was used by Thoth-Amon to flee Zembabwei, taking him instead to the far south land of Yanyoga.